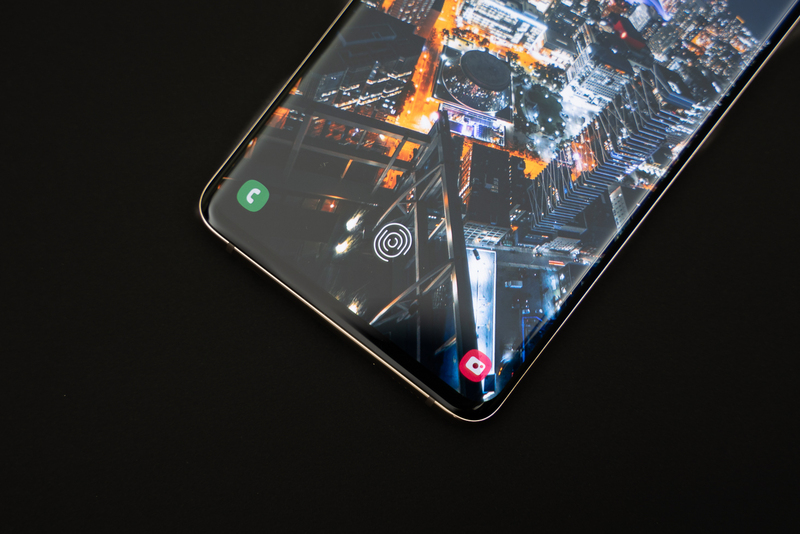 As Samsung’s heaviest hitter in the Canadian market in 2019, the Galaxy S10+ sees tremendous improvements in display quality, camera, and software. A new stunning Dynamic OLED display aces colors and brightness, setting a new bar for smartphone displays. Performance is driven by the blazing Qualcomm Snapdragon 855 chipset and up to 12GB of RAM, which translates to exceptional multitasking and gaming experiences. While camera quality is fantastic during the day, they falls short when things get dim. 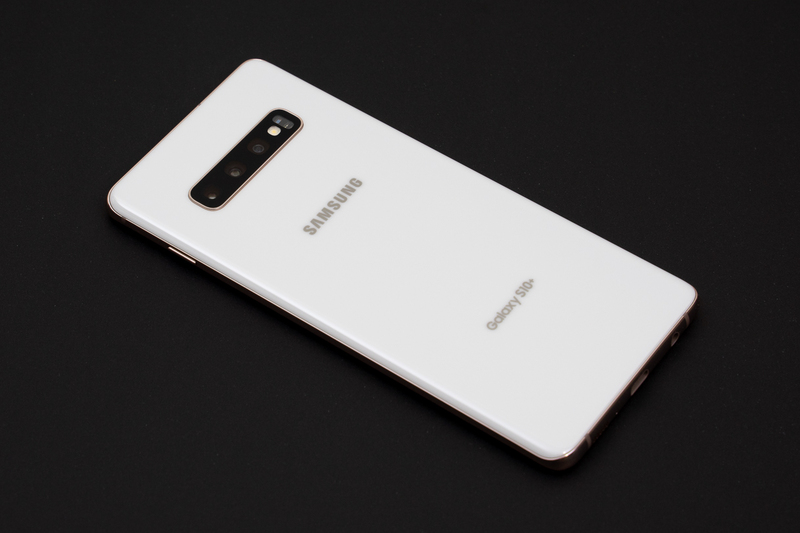 The biggest challenge, however, is pricing; even an entry model Galaxy S10+ costs CAD$1,419.99 – an ambitious pursuit for shallow wallets. New year, new camera. The Galaxy S10 now has a 16MP ultra-wide angle camera in addition to the 12MP standard and 12MP telephoto cameras. Ceramic color options are now available for those who prefer a less glossy finish. 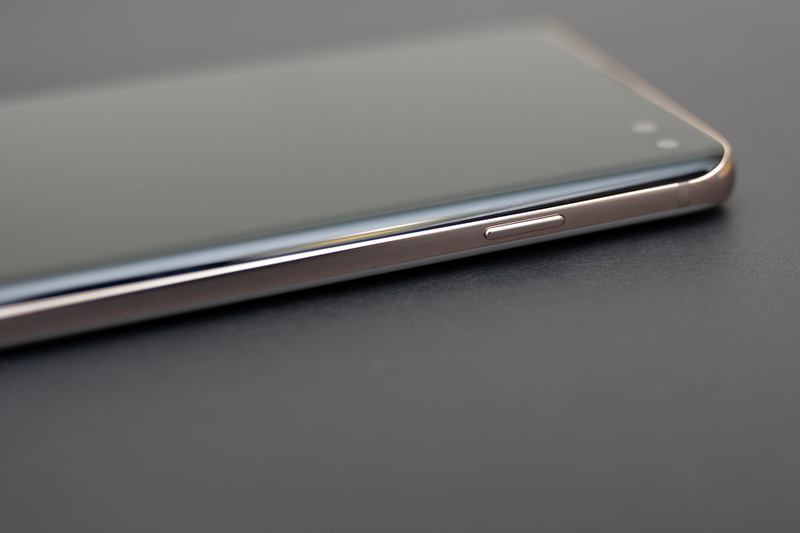 Our review unit is clad in Ceramic White, which is both less glossy and will more competently hide fingerprints. While many would undoubtedly appreciate the elegance in its simplicity, I personally feel like it’s a bit bland. 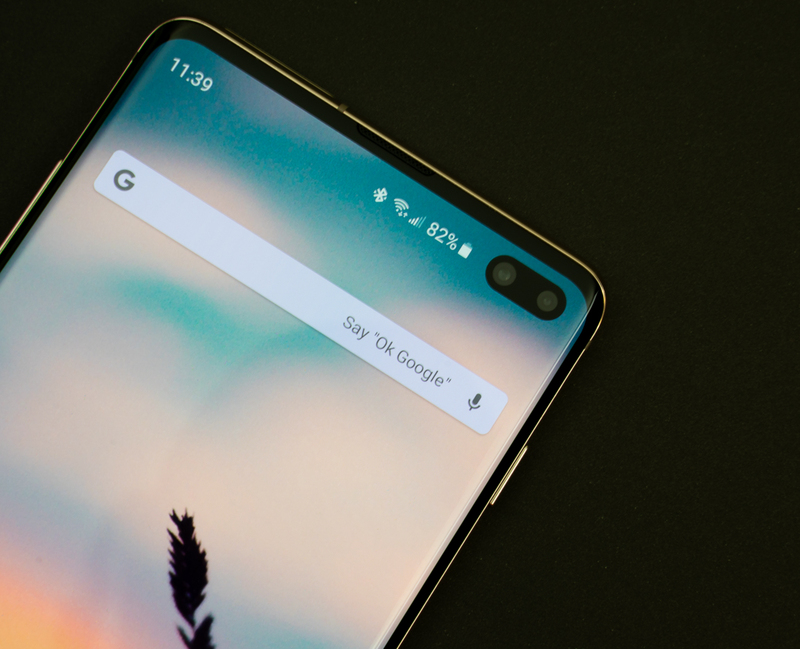 Whereas most phone manufacturers swiftly embraced the notch, Samsung vehemently defended the top bezel on their flagship devices. 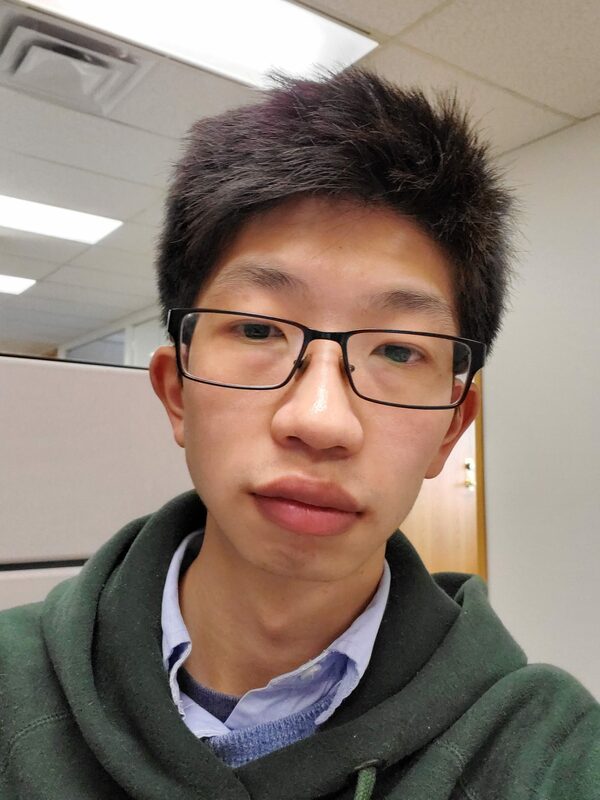 With the Galaxy S10+, it jumped from using a top bezel to a tiny pinhole front camera. 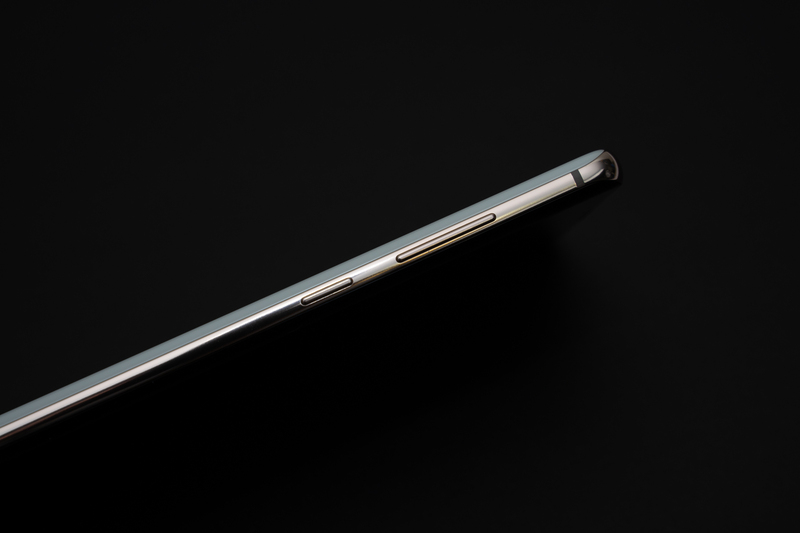 Despite the mixed opinions on its design, there’s no doubt that it’s far less intrusive than notches. The Galaxy S10+ has two front cameras: a 10MP dual-pixel image sensor and an 8MP depth sensor. Dual pixel just means that the phase detection autofocus (PDAF) sensing points have been integrated into the sensor. A gentle curve extends from the edge of the display inwards, making swiping from the edge that much smoother. Colors distort slightly when pushed against the edge, but I didn’t find it glaring. An aluminum band encircles the device, occasionally interrupted by the antenna bands. 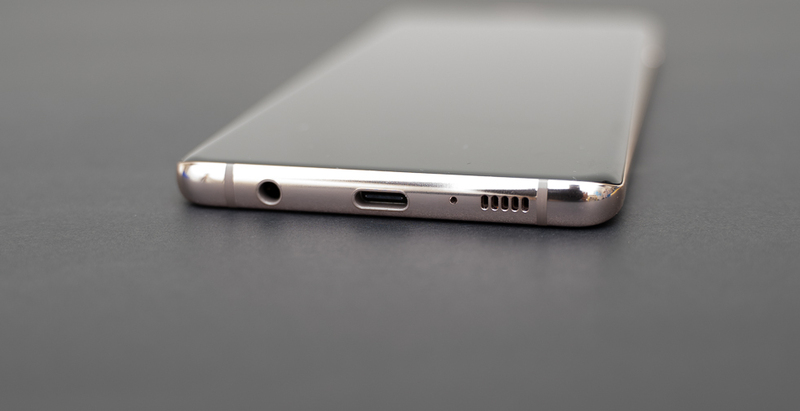 The volume rocker and the Bixby button are found on the phone’s right edge. The Galaxy S10+ creates stereo sound by combining the bottom mono speaker with the earpiece. Audio quality is great, and volume is easily loud enough for a small room. Our good friend, headphone jack, is still here! Hurray! The SIM tray accepts a nano SIM card and a microSD card, supplying the already copious internal storage with ample room to grow. I’ve never been bothered by a phone’s weight until I held the ceramic Galaxy S10+. At 198g, the Galaxy S10+ feels like an anchor in my pocket even without a case. One of the biggest improvements to the Galaxy S10 phones is its new Dynamic AMOLED display. The Galaxy S10+, the biggest of the bunch, carries one that’s 6.4” with a 3,040 x 1,440p resolution. 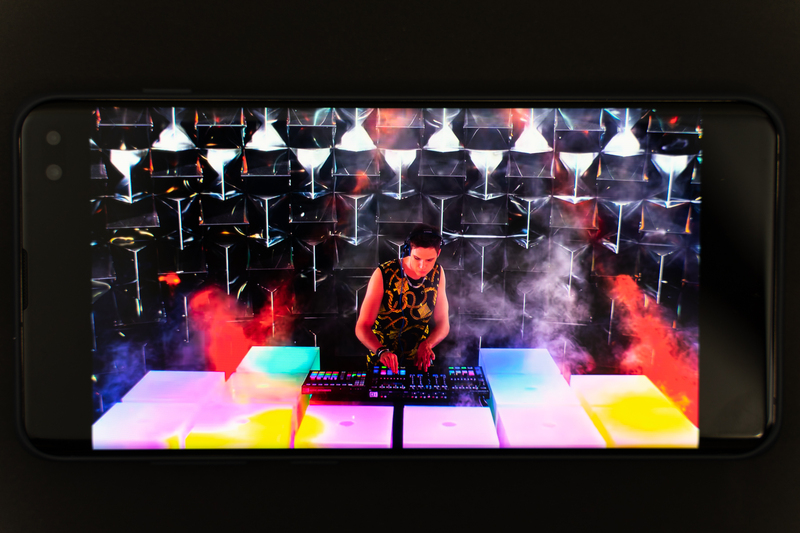 Samsung’s new Dynamic AMOLED display is set to be Samsung’s best display technology to date. It not only covers 100 per cent of the DCI-P3 color space popular in films, but also boasts an impressive 1,200 nit peak brightness. On the Galaxy S10, Display Mate measured its fullscreen brightness to be 804 nits, which is a 17 per cent increase over the Galaxy S9+. It compensates for the increased power draw of the brighter display by using a more power efficient OLED material. Despite boasting 100 per cent color gamut coverage, Samsung claims that it manages to reduce harmful blue light by 42 per cent. But wait. How can it retain the same color accuracy while removing colors? In a statement to CNET, Samsung says that previous displays actually supported color spectrums beyond DCI-P3, and that it simply dialed back on the blue light output to more closely fit the DCI-P3 guidelines. In addition, it’s the first smartphone display to ever to support HDR10+, an HDR format endorsed by major streaming services like Amazon Prime Video and Netflix. Even more impressive, Dynamic AMOLED features sub-pixel rendering and dynamic tone mapping. Subpixel design hasn’t changed, however; Dynamic AMOLED still uses an RGGB pentile subpixel layout. A traditional white pixel contains a red, green, and blue subpixel. In a pentile display, there are two green subpixels for every one white pixel. The color difference is immediately apparent upon turning on the screen. In a side-by-side comparison against the Google Pixel 3 XL with Adaptive colors enabled, which is also renowned for its excellent display, the Galaxy S10+ is noticeably warmer at its “Normal” setting, but not overly so, like the iPhone X. 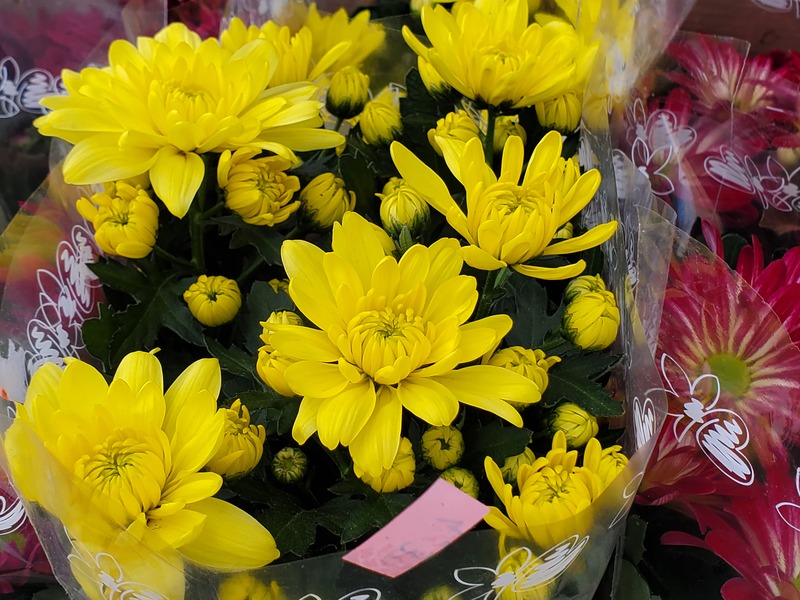 It strikes the perfect middle ground between vibrancy and eyestrain. Their colors are simliar, however, even when displaying HDR content on YouTube. Something most would consider baffling, the Galaxy S10+ omits the pre-installed screen protector found on the smaller Galaxy S10. Thinking a little deeper produces several possible explanations. Corning’s Gorilla Glass 6 is literally on the entire phone and is a major part of the experience you’ve paid for. Therefore, it simply doesn’t make sense to cover up the front, especially considering most users will buy a case to cover the back. And let’s face it: no aftermarket screen protector can match the quality of Gorilla Glass 6. With form factor and design becoming relatively stagnant over the past few years, smartphone cameras are now the main differentiating factor that affects buying decision. Manufacturers are placing paramount focus on developing innovative ways to make their cameras stand out. This year’s Galaxy carries a new 16MP ultra-wide angle lens alongside the 12MP standard wide-angle lens and 12MP telephoto lens. The ultra-wide lens encompasses 123-degree vision and an f/ 2.2 aperture. The other two sensors don’t seem to have changed all that much; resolution, aperture, and pixel pitch all remain identical to the Galaxy S9’s. Thought it recycles a few old – albeit still excellent – sensors, Samsung says it has made strides in AI post-processing features that take full advantage of the chipset’s NPU. One prime example is scene optimizer where the camera detects the scene and suggests an optimal angle for the shot. When it doesn’t recognize the scene, it can at least try to level the phone. On the flip side, the selfie cam now uses a new 10MP sensor, as well as an 8MP RGB depth sensor for better bokeh effects. Maybe Samsung is confident in the phone’s AI capabilities, but the camera seems to favor a fast shutter speed and then performs touch-up in post. Just as with the Galaxy S9 series, the main sensor boasts impressive sharpness and excellent colors in good lighting. Unfortunately, the camera has trouble capturing fine detail in darker scenes and has a haziness that generally comes with aggressive denoising. The telephoto lens features a 2x optical zoom and can extend all the way up to 5x digital zoom. Like the main sensor, it does a great job under good lighting. OIS keeps the phone rock steady during shooting. 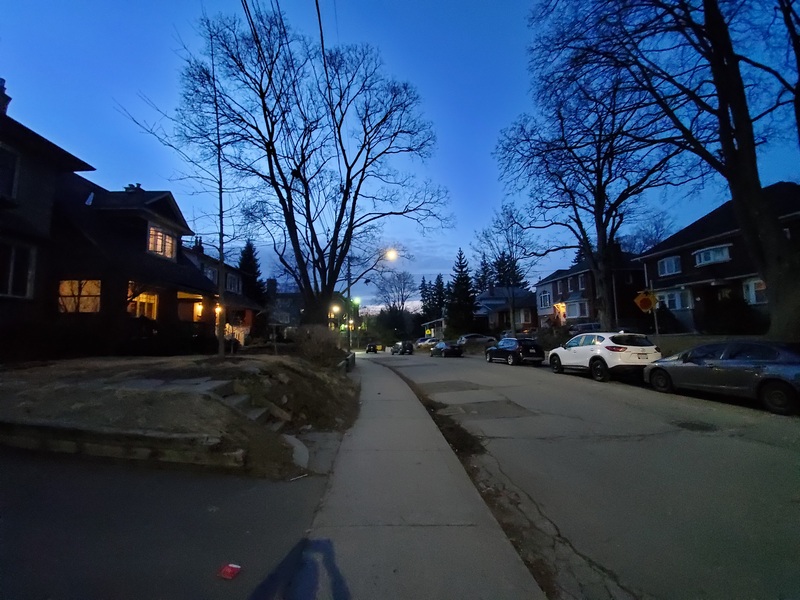 Be careful with the new ultra-wide angle lens. Because of its super wide field of view, it can sometimes capture your fingertips without you realizing. While there’s barrel distortion, it can be corrected via the distortion correction in the camera app once enabled. What can’t be corrected is the weird color “silhouettes” in certain scenes. In the darker images below, there’s a clear difference between the sky’s color in the background versus between the gaps of the tree branches. I suppose this is due to the AI unable to apply color corrections to finer areas. Photographers tend to shoot in uncompressed RAW image format to provide higher flexibility in post-processing software like Adobe Lightroom. While the Galaxy S10+ supports RAW shooting, it can only be toggled in Pro mode. When enabled, the phone does not apply any inherent post-processing and only saves the image data as they were shot. It captures a ton more detail than normal JPEG at the expense of larger file size and needing manual post processing. 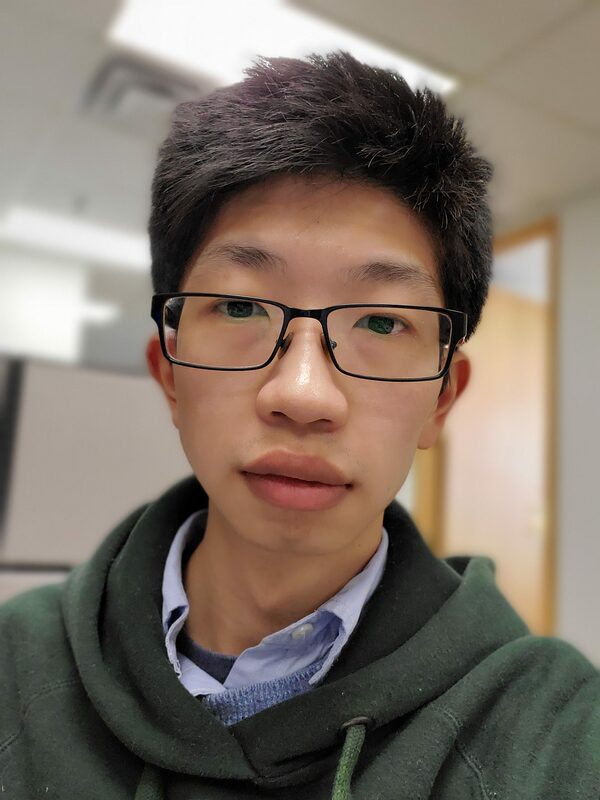 The new dual-sensor front camera does an excellent job at applying depth of field effects around strands of my hair and didn’t blur out my clothes and kept my face in focus. All Galaxy S10 series phones are powered by Qualcomm’s Snapdragon 855 SoC. It’s the first Qualcomm consumer chipset built on the 7nm transistor node and is designed to compete against Huawei’s Kirin 980 and Apple’s A12. Our review unit has 8GB of RAM and 512GB of storage – enviable even by laptop standards – and can even be upgraded to 12GB and 1TB respectively. In Geekbench, the Galaxy S10+ scored 3,474 in the single-core test and 10,890 in the multi-core test. 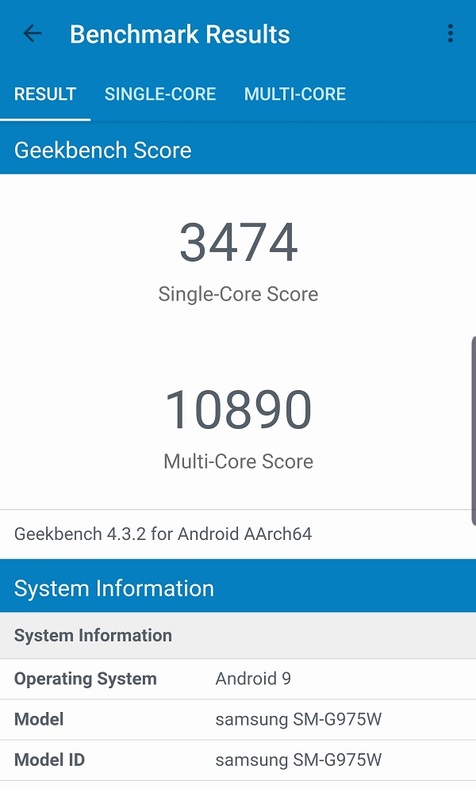 While single-score sees only a marginal improvement over the Galaxy S9+, multi-core score is around 2,000 points higher. It also beats the Huawei Mate 20 Pro by 196 (5.9%) in single-core and 1,141 (11.7%) in multi-core. 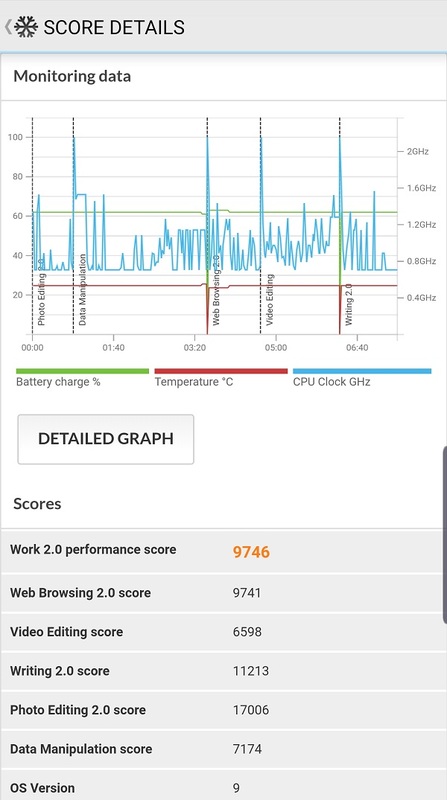 PCMark for Android is as real-world as synthetic benchmarks get. 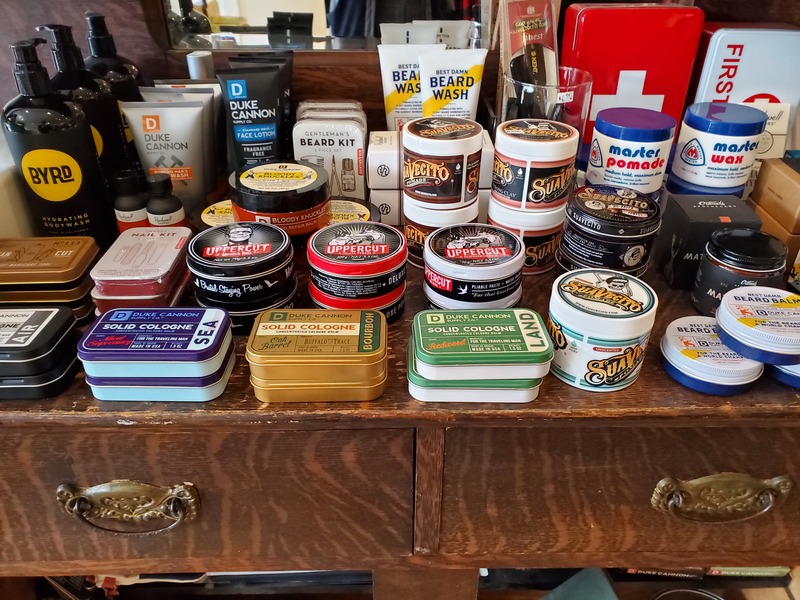 It runs the phone through a list of everyday business tasks includes writing, web browsing, video editing, and photo editing. 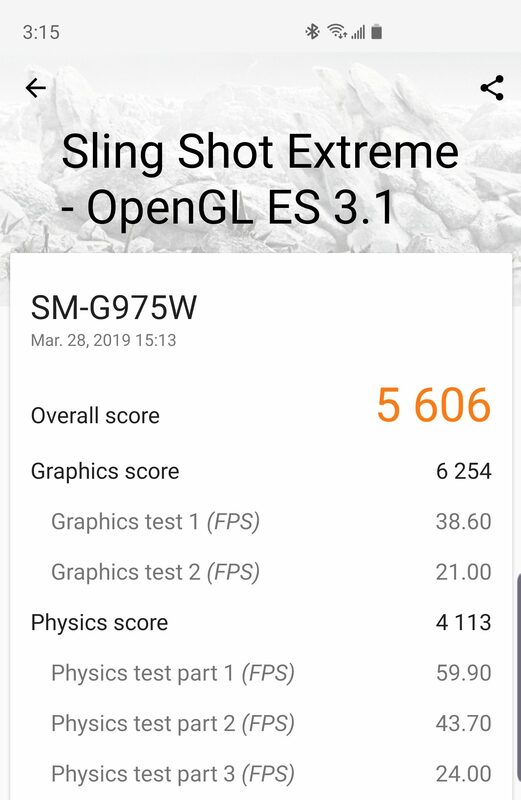 The Galaxy S10+ crushed it in PCMark Work benchmark, scoring an impressive 9,746 average. Compared to the Qualcomm Snapdragon 845 in the Google Pixel 3 XL, the biggest improvements were in the writing and web browsing categories, which saw a 1,482 (18%) and 1,655 (17%) jump respectively. 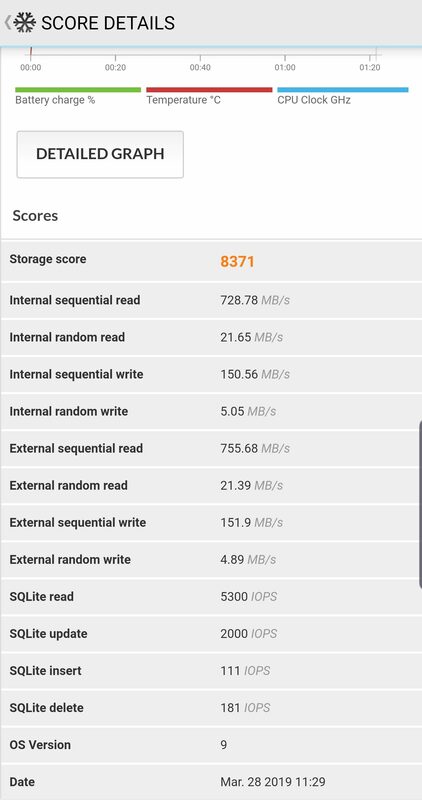 The Galaxy S10+ also handily defeated the Huawei Mate 20 Pro’s Kirin 980, which scored a 7,709 average. 3DMark gauges the phone’s graphics processing ability and attempts to estimate how well it can handle 3D intensive workloads. We’ve added a new benchmark to test for storage performance. It speaks to the phone’s ability to quickly restart, load apps, and retrieve files. Whereas its hardware is excellent, Samsung’s software hasn’t been favored in the Android community. Many consider it to be way too bloated, and the plethora of default Samsung apps irks Android purists as well. In addition, Samsung phones are always the latecomers in receiving Android feature and security updates. Since then, Samsung has been committed to solving its software’s reputation by launching its One UI initiative. One UI aims to improve UI flow, unifying app and icon aesthetics, and presenting the most important information first. And the efforts have definitely paid off. App icons look more unified, and despite being inundated with features, the most important ones are clearly labeled and intuitive to find. Some advanced features like Secure Folder and Dual Apps are now more easily accessible and configurable. Several other features are also refreshing and helpful. Download Booster, for example, couples Wi-Fi and mobile data together for faster download speeds in Google Play Store. MIrrorLink can mirror the phone’s screen onto your car’s display via a USB cable. Video Enhancer automatically increases color and brightness when watching videos. Regrettably, One UI didn’t lose much bloat; it still comes bundled with a bunch of things many users won’t ever touch beyond the initial setup. The Galaxy Store, Theme Store, and Game Launcher are just a few of the unneeded extras. It even has McAfee antivirus built-in, which is (thankfully) disabled by default. With that said, Samsung Pay is the lone exception, as it’s incredibly handy if you have a compatible card like the Tangerine Cash Back rewards card. One UI also incessantly tries to shove other Samsung services down your throat, and heavily insists that you sign up for a Samsung Account, which enables features like Samsung Cloud and Samsung pass, none of which are needed by most users. I was peppered with its notifications daily, forcing me to mute it manually. Bixby, Samsung’s beloved voice assistant, is back, and it’s still mapped to a physical button. This time around, however, it lets users remap the button to perform other more useful tasks like launching the calculator or the camera app. You’ll need to keep Bixby enabled as a prerequisite to remapping, though. Our third run-in with Bixby still leaves much to be desired. It couldn’t understand what I was trying to say when I asked it to show me restaurants in my area. 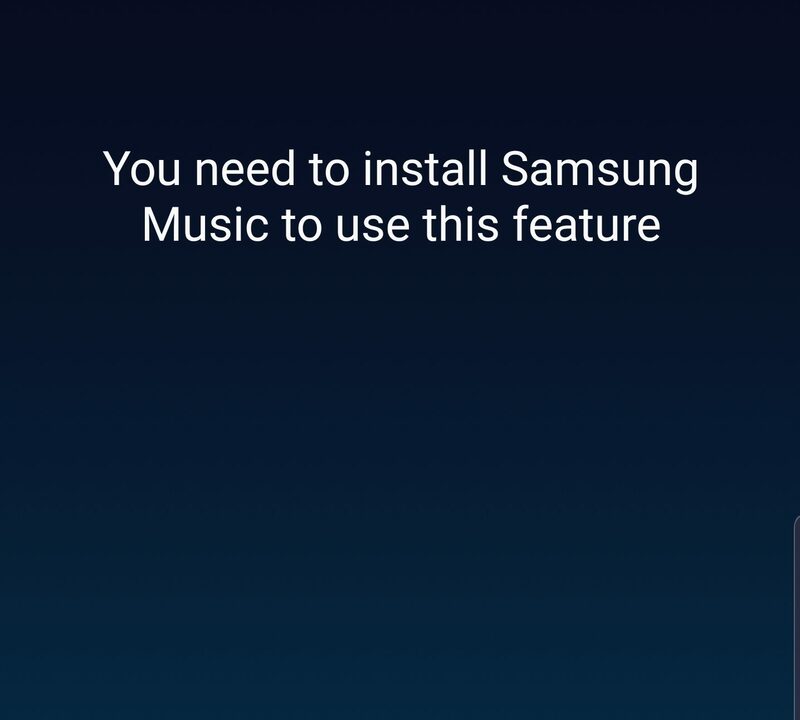 Ask it to play music Spotify, and it will try its best to convince you that Samsung Music is what you need. Hilarious. What happens when you ask Bixby to play music on Spotify. Samsung is finally ending awkwardly placed fingerprint sensors by embedding it in the display. Samsung claims that instead of capturing a 2D image of your fingerprint, its ultrasonic fingerprint sensor builds a 3D map that accounts for your fingerprint’s valleys and peaks, and should therefore be nearly impossible to fake. In my experience, the in-display fingerprint sensor is very inconsistent, often having trouble recognizing my thumb at an off-angle and requiring multiple attempts to register. With a giant 4,100mAh battery, it’s unsurprising that the Galaxy S10+ produced 7 hours of screen-on time across nearly two days. My daily workload involves composing emails, editing Google Doc files, web browsing, managing social media, and streaming videos. Most apps I use are in dark mode, which helps save battery in OLED devices. Location services are enabled while NFC and Bluetooth are turned-on sporadically. One thing that could improve the experience is a faster charger. Samsung’s adaptive charger can deliver up to 15W of power, 3W shy of Qualcomm’s QuickCharge 4.0. At this pace, it takes almost two hours to charge the phone from zero to 100 per cent. The silver lining is that thanks to its tremendous battery, you won’t have to plug it into the wall as frequently. In addition to capping the processor clock speed in power saving mode, it also lowers the display’s resolution. Because One UI is based on Android 9, it also takes advantage of Google’s Adaptive Battery power saving feature. All aspects of the Galaxy S10+ screams premium – including its price. For Canadian customers, an unlocked device runs for CAD$1,419.99 and comes with 8GB of RAM and 128GB of storage. Samsung charges CAD$1,749.99 for 512GB storage, and a whopping CAD$2,209.99 for 12GB of RAM and 1TB of storage. The Galaxy S10 series is one of the first phones to feature the Qualcomm Snapdragon 855 SoC. 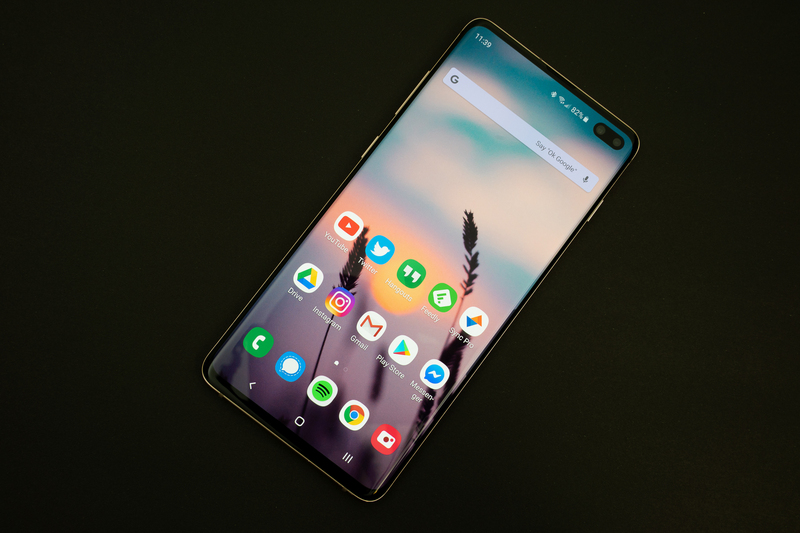 As such, competition in the performance front is relatively thin, and most phones are either from China – which are hard to get or haven’t been released yet. But competition is looming on the horizon. 2019 will see an impressive roster of big flagship phones like the LG V40, Huawei P30 Pro, Sony Xperia 1, and the OnePlus 7. A few Chinese manufacturers like Xiaomi have already released its version of Snapdragon 855 equipped devices, they’re just harder to get in North America. Apple’s current flagship can also put up some fight against the Galaxy S10+. Despite its improved performance, the Galaxy S10+ still trails the iPhone XS Max’s A12 Bionic chipset. 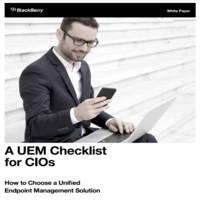 Familiarity wit the operating system makes a difference, too; some users rely on iOS apps to get through their workday. The Galaxy S10+ has a distinct edge in camera quality, AI capability, and a superior display. The newly released Huawei P30 Pro is currently the closest matchup against the Galaxy S10+. While I’m not expecting its HiSilicon Kirin 980 processor to crush any benchmarks, its camera system is extremely impressive. The starting configuration comes with 8GB RAM and 128GB for $220 less. One area it does seem to underperform in is the display. I’m still going through the motions on evaluating the P30 Pro, but at the moment, it seems like an extremely strong contender to the Galaxy S10+. 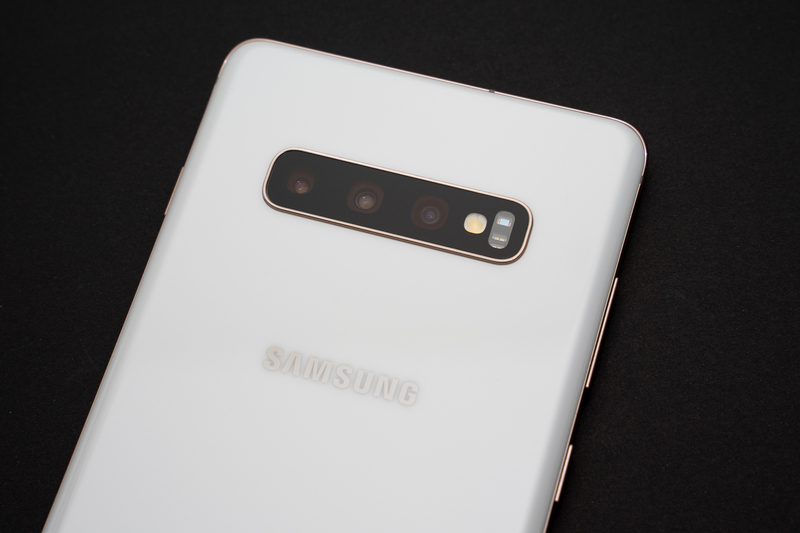 Driven by a new gorgeous display, a new camera system, and Qualcomm’s new chip, the Samsung Galaxy S10+ is the best performing phone released in 2019 so far. It also creatively eliminates the top bezel by using an unobtrusive punch hole front cam. Internal software and AI improvements refine the overall usability, and new ceramic material and color options are welcoming, too, albeit at the cost of added weight. A new ultra-wide camera finally lets users effortlessly capture stunning landscape photos. 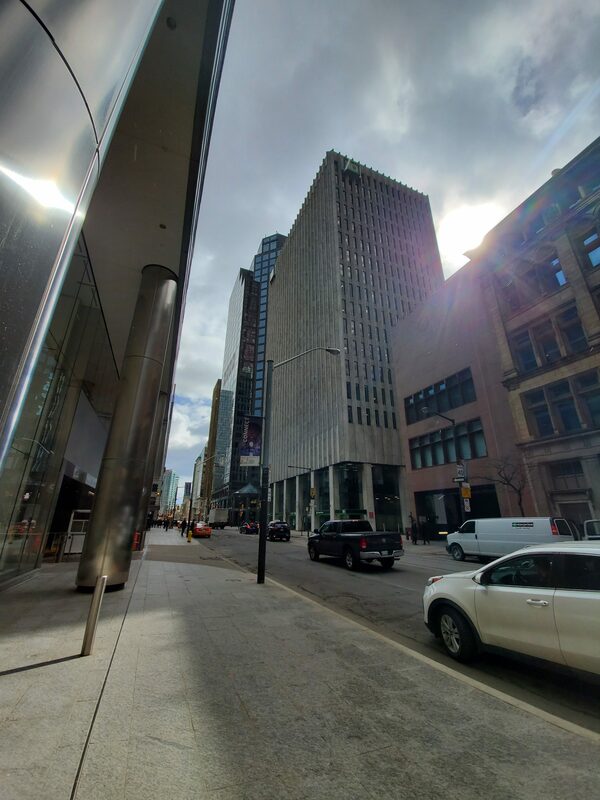 Although all three lenses produce fantastic images when lighting is good, they still trail behind the Pixel 3 XL in bad lighting conditions. Starting at CAD$1,419, pricing is the biggest deterrent for the Galaxy S10+. It’s not short of new features, but I say hold off on upgrading if you got the previous year’s Galaxy S9+ lest you desperately need the beautiful display and the extra camera for some reason. With that said, for the first-time buyer who needs the phone that does it all and has the cash to burn, then the Galaxy S10+ is a no-brainer.